'One of a Kind', do not miss it. Rare Pièce d’orfèvrerie, à ne pas Manquer. Rare, Unique French Napoléon .950 Sterling Silver 5 Francs 'PILL BOX' or Necessaire Dated 1869 with detailed Sterling Silver Clasp. The Box and Clasp are inset with 3 Rubies. This was a custom order, Handmade by well world renowned French Silversmith, Eloi Pernet, France. Fully & clearly Hallmarked with the French .950 Silver Hallmarks and by Eloi Pernet. Dimensions: Diameter about 3,8 cm, Depth about .6cm. This Box and Clasp are decorated with 3 Rubies and might have been used for 'Opium'. This Box was a Custom Order and must have been created as a 'Special Order' I have never seen another. 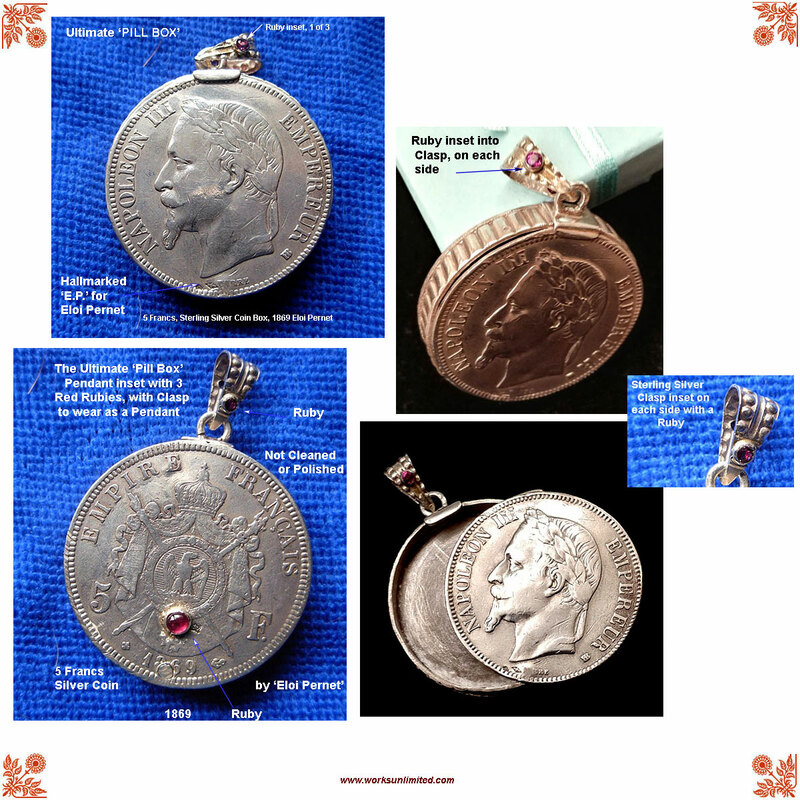 Included is a .950 French Sterling Silver Clasp that has a Ruby inset into each side, see Large Photos. Cleverly designed so that it can be Carried or with the Silver Clasp, worn with a 'Chain'. Probably intended to be worn with a Chain, a Cord or a Chain made of Gold or Silver like a piece of Jewelry, either for Aesthetics or for Safety, Security inside the clothing. However you may decide, it is truly an extraordinary 'Work of Art'. CONDITION, WORKMANSHIP & QUALITY are excellent with no dents, dings or repairs. The Cover opens and closely perfectly into a safety cover. 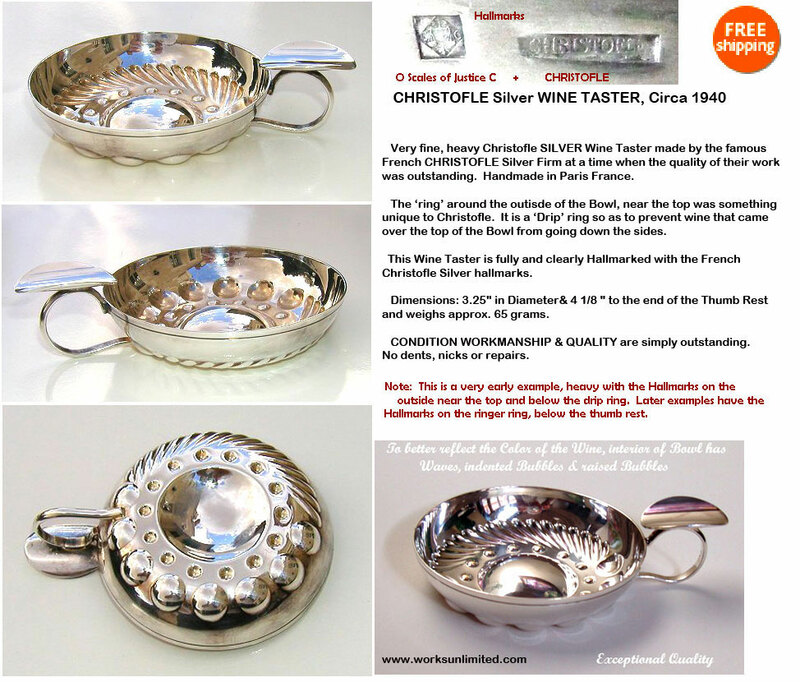 Lovely Antique French Silver Wine Taster from Paris France, Handmade by well known Silversmith, Christofle in their Paris Workshops. 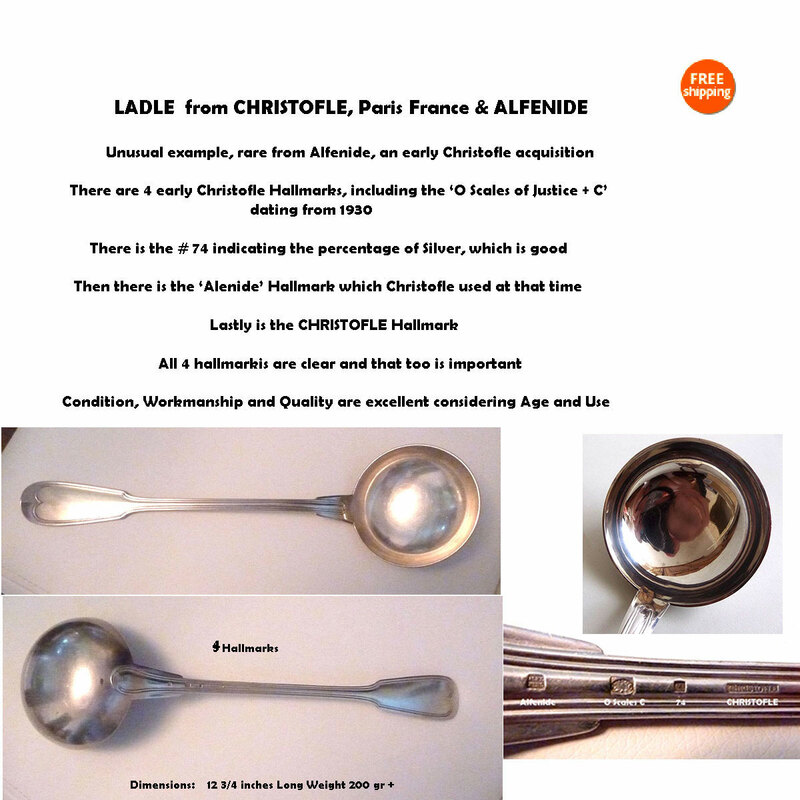 Fully & clearly Hallmarked with the French Christofle Silver Hallmarks. Dimensions: about 3 1/4" x 4 1/8" to the end of the Thumb Rest. CONDITION, WORKMANSHIP & QUALITY are excellent with no dents, dings or repairs. Because this is a very early example, the Weight is a further indication of the Quality at that time. 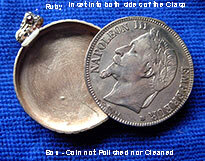 Normally, later examples weigh approximately 65 grams and this example Weighs approximately 95.1 grams. Price: $149 -includes Free Shipping, Livraison gratuite only to USA & Canada . * Reserved for Bruce, sorry. Art Deco Letter Opener, handmade in solid Bronze and beautifully decorated in raised relief depicting a Hunting scene. 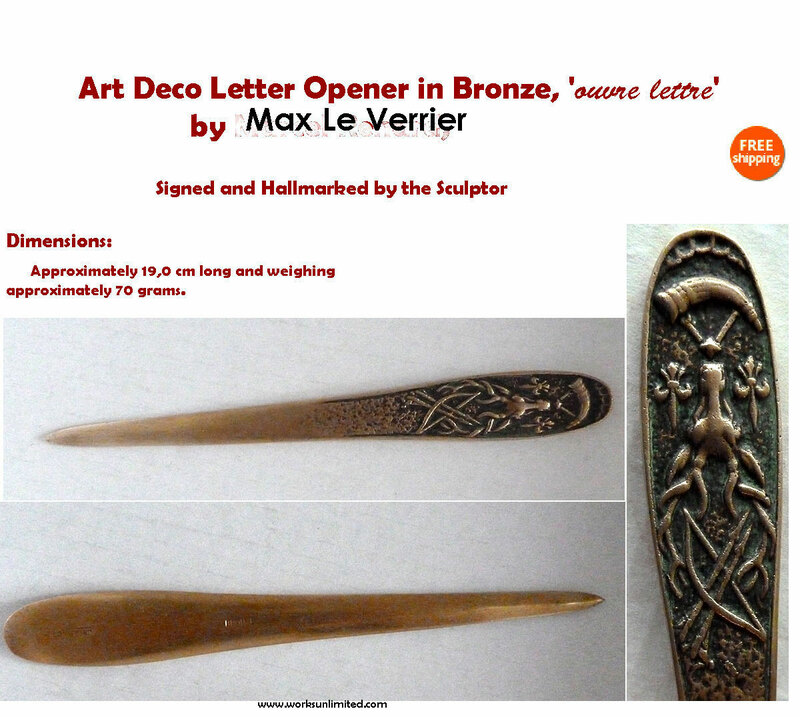 Signed, stamped 'Bronze' and by the Sculptor, Max leVerrier, he is a world renowed French Sculptor. Handmade in LeVerrier's Paris workshop. Simple but tastefully decorated in relief with a French Lily and is both practical as well decorative. Superb condition considering it's Age & Use. Fully & clearly Hallmarked on the underside (see Photos for more Details) Original model and it works. Seller misspelled 'Courier'. AND, item # 391764666954 is a Letter Opener by this Artist, @ $285. I have a short Biography on Max Le Verrier on my Daily Blog page. Dimensions: about 19,0 cm long and wighing approximately 70 grams. Price: $89.00 -includes Free Shipping, Livraison gratuite, Only to USA & Canada. Very lovely, heavy and very practical early Christofle French Soup Ladle from world renowned Silvermsith, Christofle. Clearly & fully Hallmarked on the underside of the Handle, Please see Photos for the Hallmarks. Dimensions: about 12 3/4 inches Long and weighs more than 200, grams. This Ladle is heavier and longer than later models. Alfénide was a small high-end firm of Silversmiths & Chemists in Paris, competing with Christofle in the late 1900s and was purchased by Charles Christofle in 1880, it's Name was changed and became 'Orfèvrerie Gallia' one of Christofle's Hallmarks. In 1908 Alfenide obtained it's own Hallmark, so this Spoon was made before that date, bearing the original Hallmarks for Christrofle. Hallmarks: C + Scales + C are much earlier Hallmarks than the Chess Knight with O + C. C+C was, Charles Christofle. CONDITION, WORKMANSHIP & QUALITY are excellent considering its Age and it's use.